The Wheelchair Access Large from Sanctuary has a different look from any of our other tubs because of its nearly full size swing-out door. Plenty of room is available for those who need it to maneuver from their chair to the tub. The gel coat fiberglass construction makes it easy to keep warm and clean. 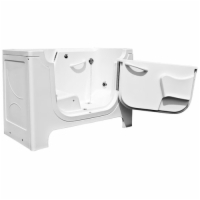 Best Feature: The Wheelchair Access tub's door is made to facilitate easy transfers to and from a wheelchair or transport chair. The Large model has an even larger door than the Medium model. Our Recommendation: Even some customers who do not use a wheelchair can benefit from the increased door size that makes it easier to get in and out of the tub. However, you will need to make sure the outward swinging door will not run into any obstacles.